Dr. Gary Schaber, MD at the Thomas Jeffereson University Hospital is expected to announce the results of new digital x-ray technology research during this week's meeting of the Radiological Society of North America in Chicago. Source: The ScienceGuide If your not in Chicago, then you are missing the biggest Radiology convention in the U.S. The Department of Defense's Mobile Breast Care Center is there. Also this year, the RSNA Electronic Communications Committee sponsors a Filmless Radiology Reading Room. The Institute of Medicine has revised its previously issued book, The Computer-Based Patient Record; An Essential Technology for Health Care. It can be ppurchased, or read on-line. The sixth meeting of this multi-speciality, interdisciplinary symposia will be held in San Diego, 28-31 January 1998. 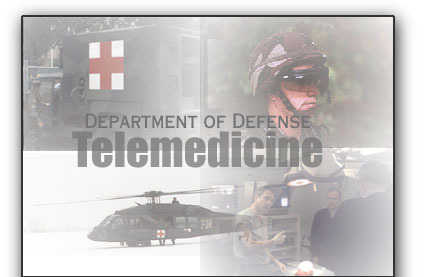 An overview of telemedicine's role in protecting and preserving the health and performance of the U.S. military. Brief discussion of how military telemedicine will support force readiness, battlespace awareness, effective and the effective employment of medical forces. To receive e-mail updates about new content on this site, please register. Thank you. MRMC: Medical Research and Materiel Command "Go Book"
Global Forum: Presentations and other information. Acrobat Real Audio Shockwave Microsoft Power Point Player. Note: This site is best viewed with an HTML 3.2 compliant browser. In addition, we are currently, or intend to make use of the Acrobat, Real Audio, Shockwave and Microsoft Power Point Player plug-ins.